I’ve used NFS volumes for storage and DiskStation NAS as NFS server. The solution have had some drawbacks and it’s been hard to synchronize users and groups, and I’ve used all_squash to a specific uid. That worked for Gogs and Drone but not for MySQL. Another alternative is to use GlusterFS volumes. GlusterFS is a clustered file-system that is capable of scaling to several peta-bytes. GlusterFS aggregates storage bricks, that can be made of commodity hardware. When I started this project, I had two Raspberry Pi 1 B+ in my desk drawer. I’ve used them as nodes in the cluster, but the small amount of RAM has shown them less useful compared to the newer Raspberry Pi 2 B based nodes. But then it hit me that maybe I could use the old Pi 1 boards as bricks in GlusterFS. One of the purposes with this project is to see how much of a Kubernetes cluster you can get for a reasonable amount. So I’d like to keep a tight budget. Normally when setting up a brick you want to use RAID, because you don’t want to handle disk failures on a brick level, but for this project it’s a reasonable solution. My first attempt was to connect the external drives to the usb port. That didn’t work of course, external disks needs more power than what the Pi usb port can deliver. There are two alternatives for solving this. You could use an external usb-hub with it’s own power supply. But that means two usb-hubs and two power adapters. The other alternative is to use a usb Y-cable and connect the extra connector to the usb supercharger (that powers all nodes). After one more trip to the store to get a Y-cable and then connect it to the usb supercharger, the problem was solved. 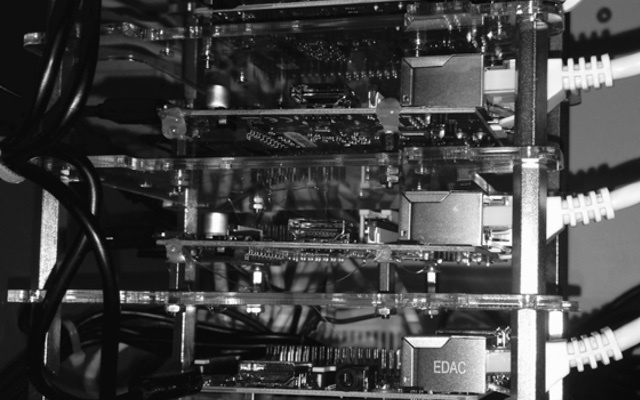 The image shows the cluster after assembling. There’s room for two more Pi:s in the switch and usb supercharger. … and mount and install glusterfs. The steps above was made on both servers. Migrating the volumes from NFS to GlusterFS was very easy. The only problem I’ve had was a silly mistake. Coming from NFS I first tried to share a volume between applications, using different paths: /vol 0/mysql, /vol/drone that didn’t work. You need to create different volumes for each application. Except from the small misconception, there’s been no problems at all. Now finally I have a Kubernetes cluster running on bare metal that can be used for trying out techniques, for building microservices. By the way, I took the opportunity to overclock my Raspberry Pi:s. Thanks to Hayden James, all cluster nodes now runs at 1000 Mhz, and it seems stable.